You know when you come across a book(something awesome)--even if it's your first read of that book's author-- you quickly declare right away that he/she's your favorite? Shay Savage is my fave for this matter. My first read from hers was Surviving Raine. And now I found her other book again, as if I am ready to start afresh from that last one. As if this is the only time to read another of hers. As if it's just this time that I am moving forward from the post-book's fever has already subsided. 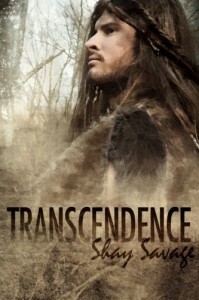 Transcendence is an easy book to rate. Why won't I give this a 5 star rating? The title says it all. The story transcend through time flawlessly. If you are looking for a caveman.. I think you'll find him here.. literally. If you are looking for a heartwarming story of a couple and in no way are alike, you'll find it here. If you are looking for a tale of love, this book will guide you and tells you about a beautiful relationship of two people from opposite time and speaks and acts differently.